Korean beauty and fashion come with its fair share of generalisations. If you think about the trends its makeup industry sets, you’ll probably associate it with looking cute, demure, and sweet. Sure, it’s a popular aesthetic, but it doesn’t mean everyone can, or wants to fit into the mould, because Korean style does not have to be one-note. Luxury beauty brand, HERA, has taken it onto their own hands to add dimension to the identity of Korean beauty, and they’ve done so by introducing the Seoulista to the world. The Seoulista is not a fixed look, but an attitude. Instead of looking like one of the masses, she stands out from the crowd with an inimitable style and persona that is both uniquely inspired by Korea, but her own as well. Branded as an icon for the 21st century, the Seoulista is someone who exudes confidence, charm and an edginess that commands attention. This aura expresses itself in the trendy clothes she dons, the sophisticated way she carries herself, and most importantly, the makeup she wears. One look at a Seoulista, and the thought, “how can I be like her?” will definitely cross your mind. HERA has made being a Seoulista accessible to everyone with their curated range of beauty products that make a statement. To help you emulate the Seoulista, we’ve picked out three women who embody the archetype and paired their looks with key items from the HERA collection. It’s your time to be iconic. It Girl and model Hoyeon Jung perfectly embody what a Seoulista is all about. Never without a bold hair colour and a persona equally commanding to match, Jung has made waves on runways around the world, in large part thanks to her fresh-faced beauty as well. Her dewy complexion can easily be achieved with the combination of both HERA’s Cell Essence and UV Mist Cushion. The Cell Essence is HERA’s top-selling skincare product. This essence is fortified with eight different skin activators that smoothen any textural issues while keeping the skin extremely hydrated. Use it as a base to keep the skin plump, then apply a layer of the new UV Mist Cushion. The cushion has been newly formulated to deliver a lasting, natural glow from all angles, giving you the kind of finesse Hoyeon has. 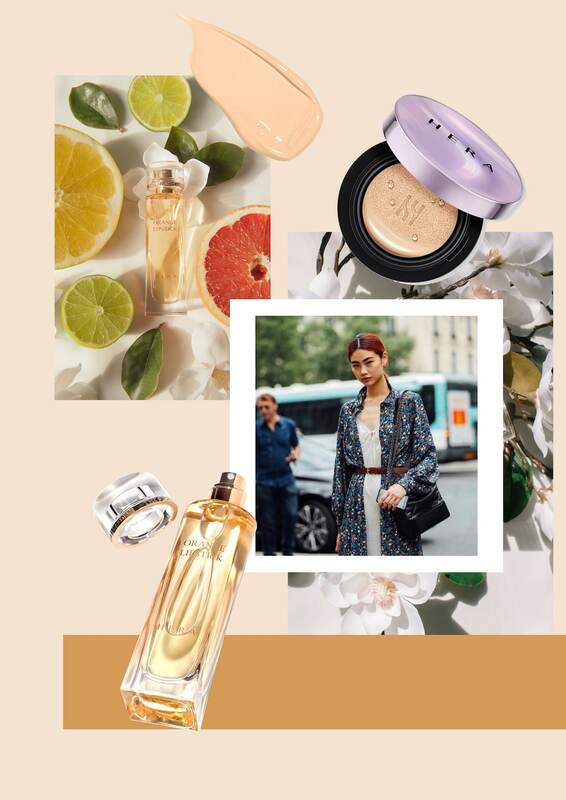 Another essential component of the Seoulista aura is the scent she wears, and someone as fresh as Hoyeon would definitely be wearing HERA’s Orange Lipstick, a citrus-forward fragrance with soft floral notes for added allure. Irene Kim is a household name in the Korean fashion and beauty industry. The leggy influencer is charming and owns every room she steps into with her fashion-forward outfits that blend streetwear with couture. Often, her looks are finished with a slick of glossy lipstick in a bright colour, making the new HERA Lip Gelcrush the perfect product to get Kim’s Seoulista look. The new Lip Gelcrush is a gel lipstick that has all the comfort and shine of a lip gloss, with the lasting power of a stick lippie. Available in 16 different shades that range from pinks that pop to sultry reds, there’s a vivid colour for every occasion and outfit you can think of. A quintessential Seoulista like Kim would need a standout perfume to finish her look, and that scent is the HERA Exceptional. Inspired by the break of the morning and the cusp of evening time, HERA Exceptional uses Asian ingredients to create a perfume that sparkles on the skin. Fresh top notes of jeju mandarin and jasmine tea segue into feminine whispers of flowers, before flaunting wood and musk notes that enhance one’s feminine mystery. HERA Exceptional is truly a scent that defines all aspects of what makes a Seoulista, much like Kim herself. Park Ji Hye is another one of those Korean women who take over a room the minute they walk in. Her androgynous style is complemented by her simple makeup looks, often comprising of light eyeshadow to enhance her deep, almond-shaped eyes, and a slick of lip tint. Park’s approach to makeup is simple, yet seductive, furthering the effortless glamour of a Seoulista. The Shadowholic 4D palette in No.5 is the kind of palette Park would sport. With four neutral brown shades, this is the ideal quad to give your eyes some smokey depth without going too over the top. Give your pout a pop of colour with the Rouge Holic Shine lipstick. As an extension of the popular HERA Rouge Holic lipstick range, this lipstick delivers a pigmented, glossy burst of colour to your lips to make them look extra juicy. 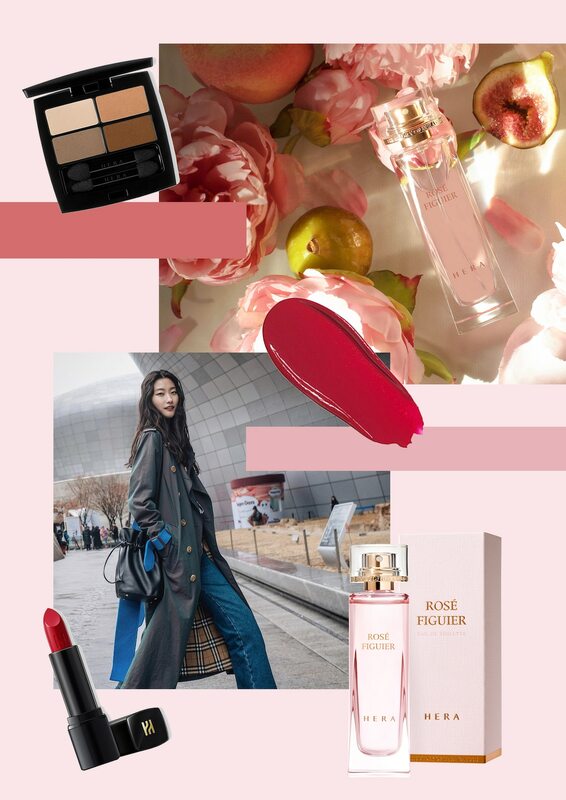 Imbue yourself with Park’s Seoulista-esque sensuality with the new HERA Rose Figuier perfume. Ripe figs and rose notes form the heart of this commanding, yet feminine scent — a perfect expression of the Seoulista’s persona. HERA is located at #B2-37, ION Orchard, 2 Orchard Turn, Singapore 238801, +65 6219 1752.